A stunning beachfront property in the quiet and laidback area of Mae Nam beach, Villa Lotus is a gorgeous six-bedroom villa ideal for travelers looking for a tropical getaway. With the ocean spread across miles ahead, guests of the villa can truly enjoy a rich, fruitful experience in the lap of nature and luxury. Nearby beaches invite you to swim and surf in the clean water and dig your toes in the sand. You can also explore the local markets for some quick shopping! The six bedrooms at Villa Lotus are housed under high-vaulted roofed pavilions and one of the bedrooms doubles as a games room with a pool table, foosball table, and sitting area for entertainment. Two of the larger bedrooms are furnished with king-sized beds, a private sitting area with a couch facing the tropical gardens across glass doors. The master suite has a private pavilion boasting of an office space and a Jacuzzi. Each bedroom has access to the outdoors and the other four bedrooms have single beds. The en-suite bathrooms have natural stone shower areas in a partially open-air structure. The remarkable 16-metre swimming pool is the icing on the cake for it is here that you can let go of all your worries and soak in its cool waters for hours on end! The L-shaped pool sporting a beautiful lotus mural sits facing the scenic view of the ocean, so that you can gaze at it as you lounge in and around the pool. There are sun chairs on the pool deck, where you can lay back, take a nap, work on your tan, or just breathe in a lungful of fresh, salty ocean breeze. Palm trees lining the border of the villa create a beautiful halo around the property for a luxe and mesmerizing view. The poolside living pavilion features a traditional roof with wooden trusses with designer lights accentuating the modern décor. Comfortable sitting is marked by plush rust-colored couches for a warm and inviting hue in the room. Antique lamps are kept on the side tables and marble flooring shine under the overhead lights in this luxurious communal space. For the family and your friends, the living pavilion is a great place to hangout and rest in. The walls are decorated with stone-carved art and other traditional Thai artwork. A vintage crockery cabinet takes up an entire wall exuding a homely and old-world charm and in front of it is the expansive ten-seater dining table where guests will be served delicious, warm meals prepared by the chef. The traditional décor combines aesthetically with modern amenities to create a classic and elegant atmosphere for the entire living pavilion. Villa Lotus also offers an outdoor dining option with another ten-seater dining table out front under a high-vaulted ceiling and open-concept. The modern kitchen is fully-equipped to serve guests with all amenities. The villa staff is always present in case you need any assistance and the well-maintained grounds and interiors will leave you impressed and satisfied. If you have any special requests, they are happy to assist from preparing a delicious breakfast to taking requests for bookings and transportation. The staff comes highly recommended so you wouldn’t have to worry about a thing. The villa is just off the beach, so all you need to do is walk down to its sandy shores for an enjoyable time. Other beaches in the vicinity include Bo Phut beach ideal for a relaxing time as you can sunbathe in your private space as it is not very crowded and the kids can enjoy in the children’s pool. Mae Nam beach is known for its beautiful water perfect for swimming and other water activities like scuba diving and kite-surfing. I've stayed at Miskawaan twice before we chose Villa Lotus as our Wedding spot. Maybe due to previous experience with the service there, everything was just perfect for us as I expected. From my favourite banana pancakes for breakfast to stocking fresh coconuts for my guests, each request was swiftly taken care of and made my week there go way too fast and so enjoyable. We were definitely spoiled by Tan and all the other staff. I so appreciate that they took care of all our guests so well. People were arriving on different dates and leaving at different times but Tan helped arrange evey car service we needed from airport to dinners. We were definitely spoiled. Parents enjoyed their breakfast, lunch and massages in their room. Sarah was great with helping with the wedding plans and on point with liasing with all my vendors. It was a flawless party and everyone had a blast! I don't have enough words to describe how amazing our wedding week was at Villa Lotus and how much I miss it!! Top notch service that's worthy of 6 stars out of 5!!! If u are planning a destination wedding, it's totally worth coming to this amazing location. You won't regret it!! Meena will help you sort your accommodations, date and anything else. Can't wait to visit Miskawaan again! We were lucky enough to stay at the Miskawaan Resort at the beginning of June this year with 20+ family & friends from the UK, Australia, US and NZ who had all travelled for our wedding. We occupied both Villa Lotus and Bougainvillea for 6 nights and can not speak highly enough of the experience. From the moment we arrived, the staff went over and above to make such a special vacation so memorable. The resort itself is beautiful and extremely well kept. The facilities available to all were outstanding and Tan our personal villa host arranged everything from a private chartered boat, Mai Thai fight tickets, elephant trekking and a 1 on 1 Mai Thai training session at our own villa – everyone was catered for. Our wedding was perfect in every way and this was due to Sarah, the event planner at the resort – nothing was too much trouble and everything was simply perfect. A special mention also goes to our photographer Anne Sophie Maestracci and hair / make-up extraordinaire Dany Lopez. To all future brides out there book them both – you won’t be sorry! Miskawaan you spoiled all of us and we couldn’t have picked a better venue for such a special vacation. We’ll be back! I can't recommend this place highly enough. The villas are stunning to say the least. They are sparking clean. In fact they are cleaned twice a day. The staff are friendly and knowledgeable and more than happy to arrange pretty much anything you want. The food is stunning and very reasonably priced. I was there for a wedding and the day was amazing. We've just come back from a 6 day stay at the Lotus Villa and it was simply amazing! It was perfect, we was overwhelmed by the beauty but our lasting memory will be the service. Every morning breakfast was amazing, nothing during the day was a problem, rooms always perfectly cleaned and some of the evening meals we had we're the best food possible! Also, can I have a special thanks for Tan.. Our Villa Manager. She was the best, honestly the best, we had an amazing week and wedding made so much better by Tan. Tan was always there and always helpful, nothing was a problem and she went the extra mile. Also, special thanks to her team, without them nothing would be possible. Words will never do this place justice, but let me try ... It's amazing. The location is stunning and the villa's are something out of a dream. The rooms are spacious, with a massive shared living space and courtyard in the Lotus villa. The pool is a great shape and length, soaking up the sun with a small shade area and enough shallow/deep areas to suit all swimmers. Breakfast is something you wish you could have everyday for the rest of your life. Continental, cooked or Thai - it's all wonderful. The lunch menu caters for all tastes, and although slightly more than beach venues down the road - the quality is well worth it. The place is so clean. The rooms are in perfect condition, and are kept that way throughout your stay. There's a pool room attached to a downstairs/upstairs unit - next to the main kitchen and living room. The master suite has an Indoor and outdoor shower as well as a massive study room attached to the bedroom, and the biggest bed you will ever see! (The size of two kings put together) BUT above all else - this place is the best in the world because of the staff. Tan, who looked after us at the Lotus villa is a diamond - pure quality customer service, with a family feel. She looked after all of us so well, was honest and open throughout the process - never selling anything other than the best outcome for our group. From waiting at the door with cold water for us when we left for taxis, to keeping a place at the table for people late to breakfast - through to booking a prize fighting kick boxer to train one of our group at the villa. Tan and her team did it all and more, over and over again. Words can't sum the place up - and our friends in the other villa said the same about their experience. This isn't 5 star, it's so much more. Nine friends and I stayed in Villa Lotus in mid February for 5 nights and wished so much it could have been longer. It was a special birthday occasion and I was fortunate that my friends wished to share it with me. But the absolute highlight was what we discovered right from being greeted at the airport to saying very sad farewells 5 days later. Tan and her team ensured that nothing was too much trouble and made every effort to make every day, every moment memorable. From the food prepare by a very skilful chef, to pool cleaning, room preparation.....nothing was left to chance and all was attended to with care and thought. It was a most special time and we are now all planning how we can return to Villa Lotus and to Tan and her wonderful team. Food was excellent and the service amazing. Small mechanical problems fixed immediately. The house is showing just the slightest amount of wear. Wow!!! Our 5 days at Villa Lotus Miskawaan has been amazing and beyond our expectations. The staff is friendly without being overbearing and the service is second to none. Tan and her team are great and made us feel so at ease and ensured we made the most of our time at the villa. We had several friends coming over each day to visit and they happily assisted in welcoming them into the villa and ensured everyone was looked after. Even when we organised a BBQ at the villa Tan and her team helped prepare everything and cleared up after our guests. Sarah Wolf who organised our wedding did an amazing job and went beyond what was required. We cannot thank her enough for her help and patience. Sarah is very talented at her job and s friendly that the whole organisation of our wedding was a smooth and enjoyable operation. Our wedding day was beyond what we expected and Sarah played a big part in this. The moment we met Sarah we felt at ease and realised that we just had to relax and let her take charge. I would recommend to anyone to get married at the villa as it is a magical experience. From the time we arrived until our departure we were cared for by the wonderful staff at the villa. The villa manager was helpful suggesting things we could do that were of an interest to us, she was able to book all our adventures and organise everything , transport etc..The food was delicious with a great menu catering for everyone even fussy teenagers.We celebrated a birthday whilst staying at the villa and there was no way of explaining the special day, from an amazing birthday breakfast with lanterns and flowers and presents to a birthday dinner with cake personalised fruit carvings floating heart lanterns on the beach and special surprises left in the room to make it even more beautiful. The villa is in emmaculate condition very clean and everything in working order.The beach is beautiful the water so warm and we spent so much time swimming in the beach and in the huge warm swimming pool in the privacy of the villa. 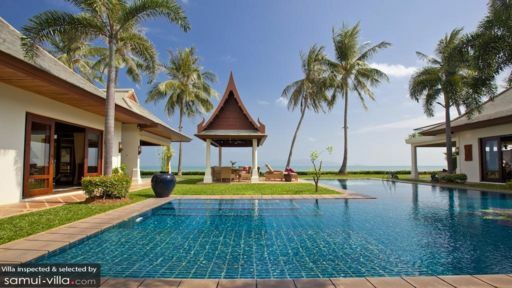 We definitely recommend Villa Lotus for a wonderful holiday. Our group had some concern over the cost of the villa compared to other hotel options in Thailand. The nightly rate was certainly on the high end so we did arrive with some expectations...perhaps more than on other holidays. I'm pleased to say that the Villa and the staff were exceptional in every category and the memories will last long after the final bills have been forgotten. The question is whether we would return...and the answer is a resounding Yes!